Terrazzo is a composite material, poured in place or precast, which is used for floor and wall treatments. It consists of chips of marble, quartz, granite, glass, or other suitable material, poured with a cementitious binder (for chemical binding), polymeric (for physical binding), or a combination of both. Metal strips often divide sections, or changes in color or material in a pattern. Additional chips may be sprinkled atop the mix before it sets. After it is cured it is ground and polished smooth or otherwise finished to produce a uniformly textured surface. Terrazzo artisans create walls, floors, patios, and panels by exposing marble chips and other fine aggregates on the surface of finished concrete or epoxy-resin. Much of the preliminary work of terrazzo workers is similar to that of cement masons. 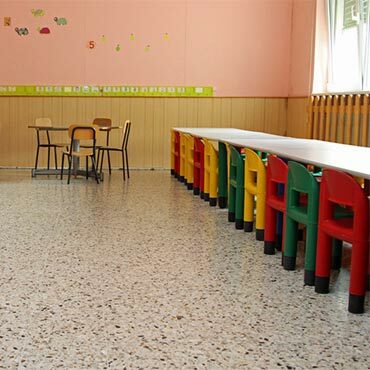 Marble-chip, cementitious terrazzo requires three layers of materials. First, cement masons or terrazzo workers build a solid, level concrete foundation that is 3 to 4 inches (76 to 102 mm) deep. After the forms are removed from the foundation, workers add a 1 inch (25 mm) layer of sandy concrete. Before this layer sets, terrazzo workers partially embed metal divider strips in the concrete wherever there is to be a joint or change of color in the terrazzo. For the final layer, terrazzo workers blend and place into each of the panels a fine marble chip mixture that may be color-pigmented. While the mixture is still wet, workers toss additional marble chips of various colors into each panel and roll a weighted roller (100–125 pounds (45–57 kg)) over the entire surface.